I've read many times that left and right in politics come from the French Revolution. But reading the Dao De Jing, chapter 31, it looks a very similar definition. The left is the place of the "second commander", the "ordinary", the "folk", the "festivities". The right is the place of "war", "first commander" closer to the king, the "mourning" and elaborate/artificial/sad rituals of the noble families. Other translations get to an even closer resemblance. So, is this just a coincidence? Or perhaps both sources (Chinese and French) have drank from the same spring? Where exactly the concepts of left and right in politics were first used in a way similar to those we use today? People who are free-thinkers tend to let others get on with their own thing: a generally liberal attitude. Authoritarians generally stick to their chosen authority base. Professor Bob Altemeyer devised a psychological test to measure right-wing authoritarianism (RWA),. He managed to get US politicians to take the test, the results from which are shown below, (and here, page 201). 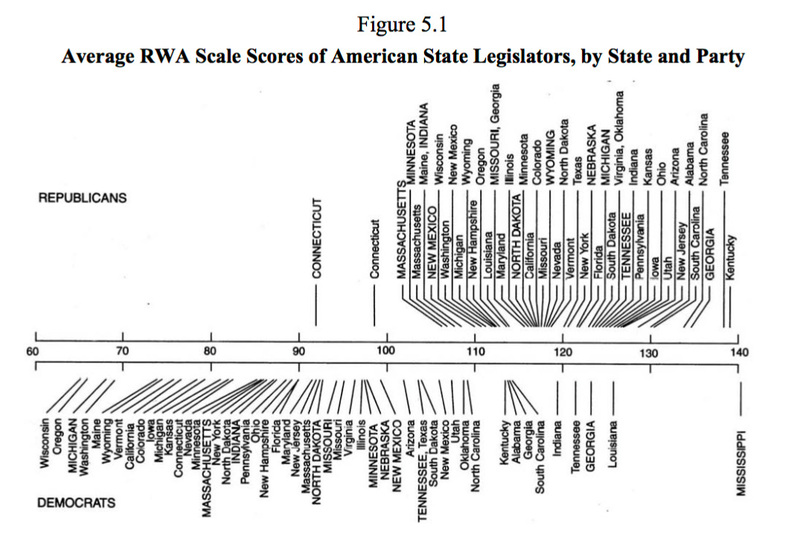 The scoring showed that the right-wing tended to cluster to their authority-bound attitudes while the left were more distributed across the spectrum, following their own ideas, however varied they were. Autoritarian versus liberal is not the only division in politics. There is also an economic dimension. The Political Compass is a good site for finding out about this. Our essential point is that Left and Right, although far from obsolete, are essentially a measure of economics. However, in its origin, and still to a large extent today, I would say, left and right relate to the social authoritarian-liberal spectrum. In the French Revolution the right were the authority loyalists and the left were the ones with new ideas. There was also a respective dimension of wealth preservation and wealth redistribution though. Presumably the rebels were placed on the establishment's left side, the "sinister" (sinistro) side, for nuanced effect, while the authoritarian loyalists were on the honoured right. The references to the right and the left will be understood when it is remembered that in China the left is the seat of honor, the right the lower and inferior seat. So in China the esteem of left and right is opposite to that in the Roman and Western world, indicating no common source. "Left" and "right" as political concepts are from the 18th Century, and the dichotomy originally refers to the dispute between supporters (right) and opponents (left) of feudalism, so it cannot be validly extrapolated to anythihing older than feudalism. Spartakus or Tiberius Gracchus weren't leftists. Left and Right as we understand (though quite often we try to misunderstand rather than understand) them aren't metaphysical principles; they are purely historical realities, utterly dependent of the development of the actual forces of society. The terms were invented by supporters of an absolutist monarchy, so unsurprisingly they used the term "right" to describe themselves, and "left" to describe their enemies. There are only two sides of our bodies, relative to the antero-posterior plane, left and right, and it stands to reason that when two humans face each other - as the president of an assembly regarding the ordinary members - that the left side of one corresponds to the right side of the other. So if the friends of the president stand to his right, he may call them the "right" of the assembly, taking himself as a standard. If they sit to his left, on the other hand, he might also call them the "right" of the assembly, now taking the benches as the standard. So, whatever the actual topographic position of supporters and opponents, the political "right" can call itself the right side, with all ideological load that this carries. The "political compass" seems to be an instrument of political propaganda for the Libertarian Party, US. 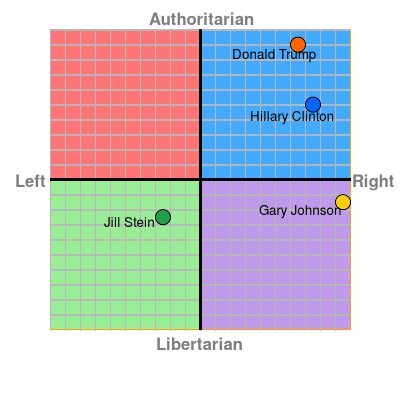 It attempts to frame political positions in a way that the best aspects of each "left" (ie, the Democrats, which in most of the world would be considered centrists at most) and "right" (ie, the Republicans) seem to match the Libertarian policies. It ignores the brutal fact that no serious political force embraces such apparently obviously excellent positions - which is probably best explained by the fact that the "best" aspects of what they call "left" are intimately intertwinned with what they consider the "worst" of that same left, and do not mingle well with what they consider the "best" aspects of what they call "right". Indeed, there is no reason why the political field should be bidimensional instead of uni- or tridimensional, nor is there any reason why, even if we agree that it is bidimensional, that it should take the form of a perfect square instead of an elongated rombus or rectangle. The quote you give from the Dao De Jing doesn't seem to be about politics at all. It seems to describe complementary, not opposite, aspects of life. ETA: an alternative - and less apologetic of conservatives - terminology from the same period, called the "left" "mountain" (for its members sat in the backbenches, which are in a higher position in an amphitheatre-like chamber) and the "right" "swamp". The first known "Political Parties" or "factions" as they were first termed that I am aware of were noted during the ratfication of the US Constitution. "Federalist" Party members were pro Constitution and "anti-Federalist" were against...and this was noted with some alarm during the ratification process as "office seeking" was seen as ungentlemanly. In other words one should asked first before one "becomes President" for example. Alexander Hamilton is the first and only proponent of "ambition" as the pre-requisite for Governing...meaning "do not ask but take." He actually wanted George Washington to be elected President for life in his only appearance before the Constitutional Committee meeting...in secret interestingly...in Philadelphia in 1789. This idea was never considered...but certainly Hamilton's "men of ambition" future was born out...and with it poltical parties. Not the answer you're looking for? Browse other questions tagged political-philosophy terminology definitions politics or ask your own question. What is the origin of love, in Hobbesian philosophy? what is Republican conservatism (in US politics)? What's the purpose of politics? Can someone be a left-wing libertarian and support free speech?